La richesse du son analogique des plug-ins UAD par USB 3 sous Windows. 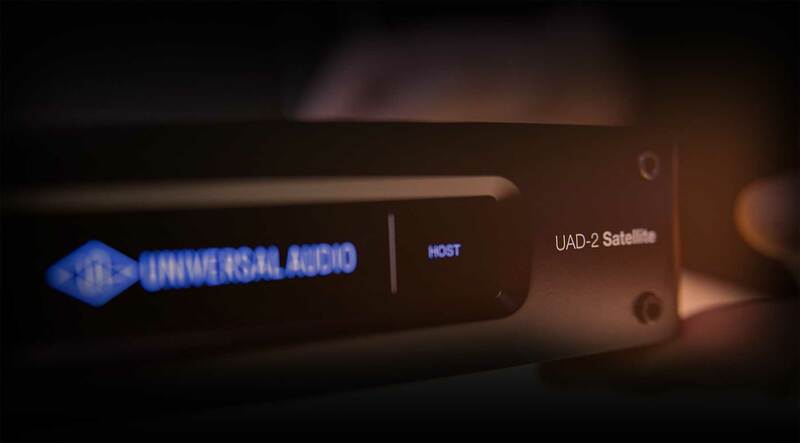 L'accélérateur DSP UAD-2 Satellite USB représente, pour les utilisateurs de PC sous Windows, un moyen élégant et performant de « doper » leur système et de traiter des mixages plus conséquents avec quantité de plug-ins UAD désormais célèbres. Cette unité très pratique vous offre un accès complet à la bibliothèque de plug-ins UA primés, y compris aux modèles exclusifs de marques comme Studer, Lexicon, Neve, et autres. Avec des performances améliorées et une latence de plug-in réduite par rapport au Firewire, l'UAD-2 Satellite USB est une parfaite introduction aux plug-ins UAD, ou une extension de DSP puissance idéale pour les interfaces audio Apollo Twin USB. Les plug-ins UAD font partie intégrante des outils des professionnels de l'audio, des « home-studistes » sérieux aux ingénieurs du son ayant remporté de multiples disques de platine. La raison est très simple : il n’existe pas d'autres plug-ins capturant aussi fidèlement le son et le comportement du matériel analogique classique – qu'il s'agisse de compresseurs et d'égaliseurs boutiques spécialisés, ou de réverbérations et enregistreurs à bande vintage. L'UAD-2 Satellite USB est disponible en version QUAD ou OCTO avec respectivement quatre ou huit processeurs SHARC. Il peut également être associé à des cartes PCIe accélératrices UAD-2 à DSP, UAD-2 Satellite FireWire et à l'interface Apollo Twin USB pour vraiment pouvoir faire évoluer votre puissance de mixage. It is very cool design. UAD Pluguins add a silky air deep to the your mix. What they did was right. Already can't wait to get another one. It does what it sez! More power,more power,and more power.Works awesome with my Apollo twin usb and came with $800+ worth of crucial plugins.Bought mine under a promotion to get the free plugs.Awesome product! I think this unit is priced to high. For the same amount of money, I can get a great sounding A/D & D/A converter and Audio interface in one unit. It might not have the same processing power but it will have some. As a windows user, I must say I am overjoyed that UA has made this USB 3 version of their Satellite. I already have an Apollo Twin USB, so the two of them work together perfectly. I have not had a single problem with any om them. I could not be more satisfied. Now I am just waiting for UA to make a USB version of the Apollo 8, and then there will no longer be any need for an extra A/D converter. In other words, couldn't be happier! It is very cool design. UAD Pluguins add a silky air deep to the your mix. What they did was right. Not only does UAD plugins sound amazing, but for the hip hop I'm doing. Literally all I need is probably another quad or an octo and my set up is complete. The DSP this saves you is amazing. Combined with Reason's current 10.3 beta (VST improvements) I'm able to work more seamlessly and creatively now and its definitely showing. UAD is definitely the standard right now. Soo far a great product! I had issues with the Apollo USB and my PC. Bought this to keep access to plugins and take advantage of promotion. Very happy with the quality of every UAD plug-in I have used. Once I got the Twin (usb) I was hooked. You kind of get pulled in, which is why I also purchased the UAD-2. UA gave me the option to select optional plugins so as not to duplicate any I already had. My little single player studio now produces great quality recordings and I am only just starting to explore possibilities. Superior products!! Registration and installation was a breeze. Works absolutely flawlessly in tandem with my UAD2 Duo and now I can really enjoy the sound of my plugins without a compromise. Simply, you have additional "computer" AND you are able to use UAD Plug-Ins. I am traveling frequently and this piece of equipment makes it easy to work even on a laptop with relatively lower capacities. Home-studio must have! bought this to take the load off my cpu then find out it will only run the uad plugins. that didn't work for me so I returned it. probably works good for that but it wouldn't help me with my plugins I already have. Works perfectly under Windows 10 Pro 64 bit, very stable, I use it with Cubase Pro 9.5, installation and activation very great, i use with addition to a UAD Solo Pcie. I bought my first Satellite Quad in August this year to enter the UAD world and immediately fell in love with the great plug ins. I've tried them in an existing mix of a finished production and could clearly see/hear the improvmentes achieved by great sounding plug ins such as the LA-2A, 1176, SSL Channel, Neve Channel or the Ocean Way Studios. With the 4-710 d Twin Finity promo I got my 2nd Satellite for free, great deal!! I resurrected my studio I had from 8 years ago, and Powercore was out of the picture, so this was the new king. Got it and do not regret it at all, already aquired a few plugins that helps a lot getting great sound out of my tracks. Exciting times!